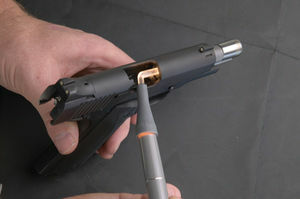 Fiber optics light the bores of handguns, rifles and shotguns to make checking for leading, fouling and rust fast and easy. Ideal for regular firearms maintenance or for examining used guns prior to purchase. Two AAA replaceable batteries supplied.